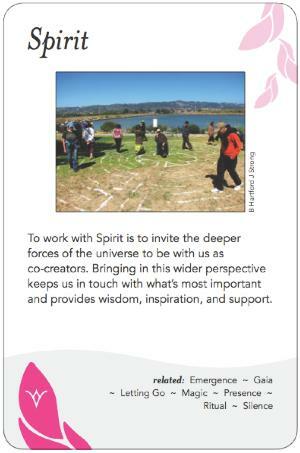 To work with Spirit is to invite the deeper forces of the universe to be with us as co-creators. Bringing in this wider perspective keeps us in touch with what's most important and provides wisdom, inspiration, and support. There is so much more to the world than just us humans and our day-to-day concerns. When we ground ourselves in that larger perspective in a deliberate way, special things happen. While Spirit cannot be commanded, it can be befriended. Groups that choose to deliberately tune into the larger whole--regardless of whether those groups have any religious basis--often find surprising results. Calling in Spirit (whether you choose to call it God(dess), Source, Intuition, or whatever else) may happen through prayer, setting intention, a simple, genuine call for help, or other means. "Mould clay into a pot, but it is the emptiness inside that makes the vessel useful." Don't talk about it too much, "it outruns language" . . . and don't fake it. “Although I have written much on the subject of Spirit, I have never been able to define it. Then again, I have never felt any particular need to. My experience, shared by many I believe, has been that we know Spirit when we meet, and no precise definition is necessary, or even particularly useful. We know that when Spirit is present in a group of people, wonderful things can happen. We also know that when Spirit is somehow absent or flagging, no amount of money in the bank, technology in the backroom, or executive talent on the roster makes much difference - nothing really seems to go right. Of course there are times when precise statements about the quality and nature of Spirit are important, but in the work-a-day world, it is usually sufficient to acknowledge the presence of Spirit, by whatever name. Call it what you like - team spirit, esprit de corps, Great Spirit of the Cosmos - sooner or later they all connect. I think. But the critical thing is to acknowledge Spirit when we meet, and somehow summon it again when it is absent.